Registrations open early November two thousand seventeen. Regitrations close five fifteen pm GMT twenty January two thousand eighteen. Sit HPAT Ireland twenty fourth February two thousand eighteen. Results released late June two thousand eighteen. The Health Professions Admission Test – Ireland (HPAT – Ireland) is an admissions test used to assist with the selection of students into medicine and health professions degree programs. The test measures a candidate’s logical reasoning and problem solving skills as well as nonverbal reasoning and the ability to understand the thoughts, behaviour and/or intentions of people. HPAT-Ireland 2019 Registrations are now closed. HPAT - Ireland Practice Test 4 is now available for purchase. HPAT – Ireland will be held on 23 February 2019. 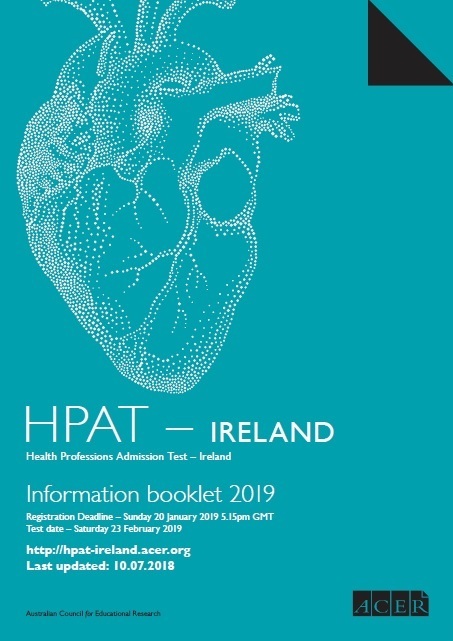 The HPAT - Ireland Information Booklet 2019 is now available.